Add the coconut milk, 1 cup of water, nutritional yeast and plant-based buttery spread to a medium saucepan and bring to a boil. Then, reduce the heat to medium-low and simmer for 6-7 minutes. Meanwhile, create a slurry by whisking together the potato starch and 1/2 cup of cold water in a small bowl. Slowly add the potato starch slurry to the simmering mixture in the saucepan on the stovetop. Whisk them together, and then let the sauce thicken over medium-low heat for another 3-4 minutes, stirring often. Once the sauce has reached the desired thickness, then remove it from the heat and stir in the dried parsley. Season to taste with salt and white pepper. Cover and set aside. Makes ~1.75 cups total. Follow package instructions for cooking your pasta noodles until they are al dente. While the pasta is boiling, place the chopped broccoli in a steamer basket. Add an inch of water to a large pot. Place the filled basket inside the pot and bring to a boil on the stove. Reduce heat to medium, and steam the broccoli covered for ~5 minutes, or until just tender. Then, remove the pot from heat and uncover. To serve, divide the pasta noodles between 4 bowls. Top each with 1/4 of the steamed broccoli and 1/4 of the warm sauce. Enjoy! 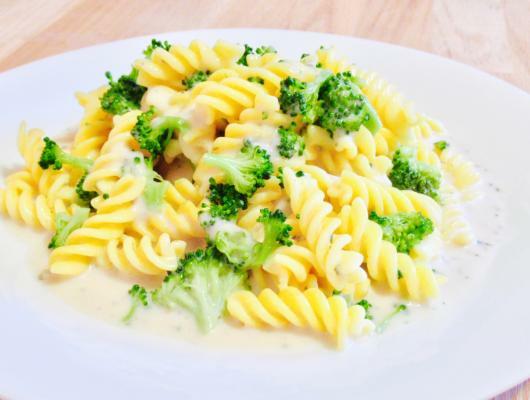 This smooth white sauce, steamed broccoli and gluten-free pasta make a delicious combination. 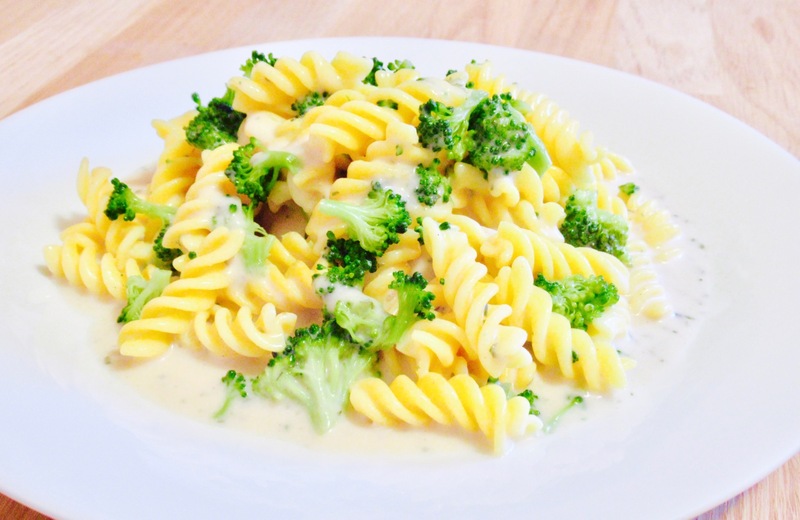 Nutritional yeast gives the sauce its "cheesy" flavour, and coconut milk makes it creamy. The entire meal can be ready to serve in just over 30 minutes. This recipe has soy-free and low-FODMAP options. A low-FODMAP serving size for this sauce is 1/5 of this recipe, or ~1/3 cup of sauce. Broccoli is low in FODMAPs at a 1-cup serving size. Soy-free option: Use a soy-free plant-based buttery spread. I used white pepper to season this sauce because the colour blends in perfectly and it also adds a nice flavour.